Spider-Gwen. Ghost-Spider. They really can’t make up their minds. From the recap page, they don’t seem very confident in this rebranding. Is rebranding the right word? I must admit, I was a little confused myself. The closer it got, the more this book seems like a reboot, for all intents and purposes. That recap page doesn’t even mention the fact that she doesn’t have powers of her own or that she has a symbiote, and everyone else is ignoring it too. Not a great way to get long time Spider-Gwen fans on board, but let’s give it a chance. Let me get it out of the way and ease your fears: this is a pretty solid book. I don’t think anybody likes an ongoing starting with an event tie-in, but what are you gonna do? 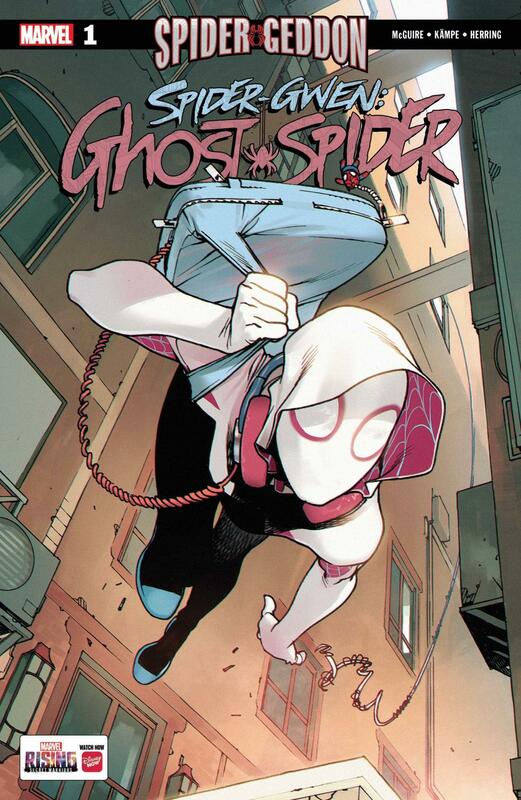 Spider-Gwen: Ghost-Spider #1 is still an entertaining first chapter in Gwen’s own fight against the Inheritors, and for the most part it pays its respects to Latour and co.’s previous run. I’m still not really clear whether or not she actually still has a symbiote… One panel shows it emerging from her hood. Is it just hiding the whole time? It would be weird to still have it around and not mention that to new readers at all, but I guess I can just be glad that it’s still sort of there. The dialogue is believable, except for whenever Gwen is in a fight. It’s like McGuire doesn’t know which quips to use, so she just throws them all at the wall to see what sticks. They’re fine on their own, but together it’s too much. The pacing is a little weird; you’ll want to read half of this, then read Spider-Geddon #1-2, and then read the second half of this, but it works surprisingly well, with a sufficient flow and enough happening in the pages to make the price feel warranted. The book pays its respects to the previous run in terms of visuals, too. Anyone who wasn’t a fan of what Robbi Rodriguez brought to the table will likely be satisfied with Rosi Kampe’s offer instead, being a much more traditional, refined look. Her movements aren’t easy to follow, but the slack is picked up by faces and body language. Ian Herring’s contributions are my favorite part. He’s definitely trying to emulate Rico Renzi’s portrayal of Earth-65, and it totally works. It makes this feel like a much more genuine continuation of the Spider-Gwen stories before it.